Pre-heat oven to 400 degrees. Generously oil a roasting pan with olive oil. Gently squeeze the seeds out of the tomatoes and strain the juice out through a fine strainer and reserve. Place the tomatoes on the roasting pan cut side down and add the garlic cloves. Roast tomatoes and garlic together for about 15-20 minutes, shaking pan occasionally to keep tomatoes from sticking to pan. Remove the roasted tomatoes from the oven, and allow to cool for about 10 minutes. Pick off the tomato skin, which will have loosened during the roasting process. Then place the skinned tomatoes, garlic, roasting juice and reserved juice strained from the seeds in a blender and blend until smooth. Season with salt and pepper to taste. The fresh, sweet flavor of Kumato® brand Tomatoes are enough flavor for this tasty sauce, but dried or fresh herbs can be added. Toss with pasta or pour over ravioli or meatballs. 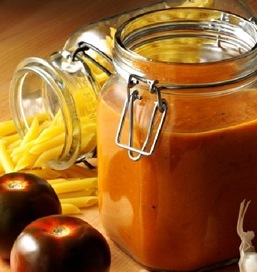 This sauce has a beautiful deep orange color and is less acidic and sweeter than traditional tomato sauce.